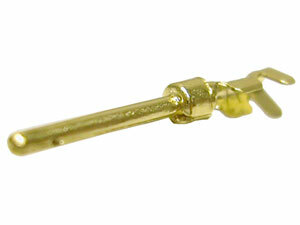 D-Sub Hi-Density male Crimp Pins, 100/bag Gold plated. D-Sub Hi-Density male Crimp Pins, 100/bag Gold plated. Good for all standard crimp type male connectors. In assembly of a working cable, the connector & pins are essential to provide the actual connection interface between two devices. Such an important function relies on durable and reliable materials, manufacturing, and design. These pins are made of the highest quality materials to ensure maximum operational efficiency during high intensity and mission critical applications. Hi-Density D-Sub or DB Crimp Gold plated contacts / pins. 100pcs. per pack. .